I liked her answer entitled, "Love Letters." I'll start: "Our love will soon take flight!" "A home full of Love"
I love it, Jana! So sweet! My love is growing every day. Great answer, Rita! There's something about this image that I love! Every week, there's always one answer that makes me think, "Now why didn't I think of that?" Yours is it this week! Thanks, Natalie! Nice answer, Mary! This image is receiving some very creative answers! 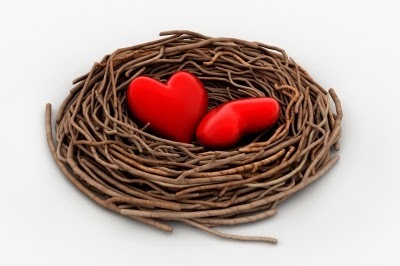 OUR LOVE WILL NEVER LEAVE THE NEST!!! Aw. sweet answer, Linda! (I'm still sad that I have an empty nest!) I agree, the answers are pretty amazing this week! I never knew there were so many ways to use the word, "nest!" Very creative answers this week! Including yours! Several people have told me they are not receiving email notifications of my blog posts. I think I am going to change to a different server, I just haven't done it yet. Thanks for letting me know, Christy! Oh, and nice answer!!! I'm in the same boat Christy. I think this is happening to a lot of people, because I am not receiving emails for a lot of the blogs and authors I have been following. I know most people aren't receiving min either, even though I do. It's very frustrating. I did resubscribe to Taylor with a different email address and am now receiving her emails. I'm glad you are receiving email notifications once again, Sherry. I receive my own also, but many others do not. Go figure! There's definitely a glitch in the system. Really great answers this week, yours included, and now I have the task of choosing a winner! I'm going to try that! Hopefully it works!